Imagine a project where you are going to replace an existing condenser with a newer model. Does this “change” trigger the MOC element or does it fall into the Replacement in Kind exemption to the MOC requirement? This question comes up from a customer several times a year. The answer – if you are short on time – is: An equipment change rarely qualifies as a Replacement in Kind. This text is about the scope of the MOC requirement; or to put it another way: What triggers the requirement? 1) Are there piping / valving changes? 2) Is the overpressure protection the same? 3) Does the new equipment require any changes to the inventory calculation, relief calculation, equipment schedule, etc? 4) Are there any changes to the electrical requirements and controls? 5) Does the new equipment require any changes to existing SOP(s) and MIP(s)? 6) Does the new equipment require any changes to the existing MI schedule? 7) Does the new equipment require any changes to the existing Operator Training? 8) Does the new equipment require any change to the existing Process Hazard Analysis to ensure it properly identifies, evaluates and controls the hazards of the new equipment? 9) Are there any other ways that this new equipment could affect safety and health? That’s a lot of questions to ask and it’s really just the beginning of them. To even consider this new equipment a Replacement in Kind, we’d have to ask all these questions (and more) and answer them with “No, there are no changes required”. You know a great way to ensure that you ask these types of questions and properly document your answers? THE MOC ELEMENT. It is literally a written program to Manage Changes. While it’s not very likely that you will go through the entire MOC procedure and find there are no required changes to the PSM program, if you did so, then you could properly quantify the replacement as a Replacement in Kind and you would have your written questions and answers to defend that judgement. Why do so many people think that these types of equipment changes are not covered by the MOC requirement? Often it’s as simple as getting bad advice from consultants or refrigeration “schools.” I think part of the confusion on the issue stems from legacy industry guidance. For the vast majority of Ammonia PSM practitioners, the IIAR is our go-to guidance on design, construction, startup, decommissioning, maintenance, etc., so it’s natural to refer to them for PSM guidance. 1) The term “Like for like” does not exist in the text of the PSM or RMP rule(s) and only leads to more confusion. 2) The first bullet of the 1994 guidance muddles the issue with assumptions. In the legal realm this is referred to as “Assuming facts not in evidence” meaning that the argument is relying on data that hasn’t been provided. We don’t know if the “piping, specifications, connections, instrumentation, and controls” are identical until we actually perform the MOC or something A LOT like it. 3) The second bullet of the 1994 guidance and the revised 2012 guidance are clearer, but they suffer from the same problem with assumptions. Note: The IIAR is currently updating the Process Safety Management and Risk Management Program Guidelines and I expect the new version to significantly alter this guidance. Misclassifying a covered change as a Replacement in Kind often allows the facility to circumvent the Management of Change procedure. 2) The new stubs did not have caps installed and were therefore open to the atmosphere. 3) The P&IDs no longer reflected the as-built condition of the facility for either of the condensers. 4) The SOPs still referred to the OLD models, not the current ones. 5) The SOPs still referenced the removed relief valves. 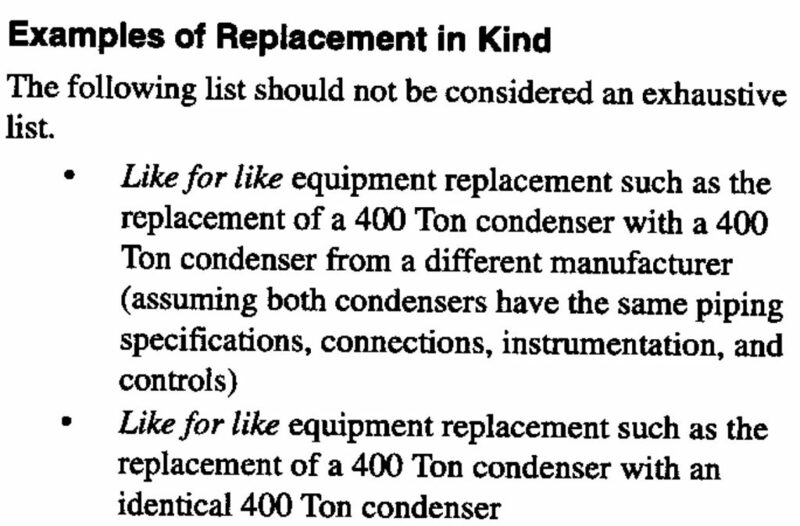 6) The PHA section covering condensers still listed relief valves as a safeguard and therefore did not properly identify, evaluate and control the hazards of the condensers. ALL the above issues would have been avoided with a properly conducted Management of Change procedure. This entry was posted in Compliance, EPA, IIAR, Management of Change, OSHA and tagged EPA, Management of Change, OSHA, PSM, RAGAGEP, RMP. Bookmark the permalink.